The Bankies put last week’s disappointing result at Renfrew behind them with a strong 3-0 victory over a battling Largs Thistle side. Battling is the operative word here, as the visitors had six players booked and were lucky to end the match with a full compliment of players with Nicky Jamieson seemingly destined for an early bath with his antics. Not for the first time this season the Bankies got off to a fast start with Nicky Little and Cammy McClair both scoring in the first seven minutes. Little added the third at a time when Largs looked to be at their most threatening to kill the match and solidify the Bankies position in second place in the league. McAnespie made a couple of changes from the Renfrew match with Adam Asghar coming in as a straight swap for Chris Dooley, and Del Hepburn started as the main striker in place of the injured Sean Higgins. Jordan Shelvey joined the warm up and shouldn’t be too far away from a return to action. For the third time this season the Bankies blasted in two goals in the opening minutes of the match. The quickness of Del Hepburn paid dividends after only four minutes when he was alert to a knock on from a long ball. He beat the keeper to the ball who could only barrel into the Bankies striker for a penalty of the stonewall variety. Nicky Little did the rest by confidently side footing the ball into the corner of the net sending Cousar the wrong way. Three minutes later and Cammy McClair added the second with a sublime strike. Nicky Little prodded the ball to Hepburn who fed McClair on the left hand wing. Little continued his run hoping for a return pass, but the Clydebank winger stepped inside and beautifully curled the ball into the top corner of the goal at the far post. Largs fought hard to get back in to the game but the Clydebank were resolute and the visitors could find no way through. If anything the Bankies should have extended their lead. After 28 minutes, Little won a high ball that sent Hepburn free on the left hand side. Despite being challenged all the way Hepburn managed to force the ball past Cousar, but there wasn’t enough power on the ball and a Largs defender managed to clear the ball off the line. After the half hour Largs had their best spell of the match so far. Firstly, the ball was dinked over the Bankies defence putting Ben Black through on the Bankies goal. Luckily, Waters was alert and he raced from his goal to block the ball for a corner. Then the ball broke for Muir on the right hand side of the box, but Andy Paterson threw himself courageously in front of the winger’s strike and diverted the ball out for a corner. Despite Largs playing much better now, the Bankies could easily have scored two more goals before the break. Chris Black showed great tenacity on the right wing riding three challenges before releasing Nicky Little. 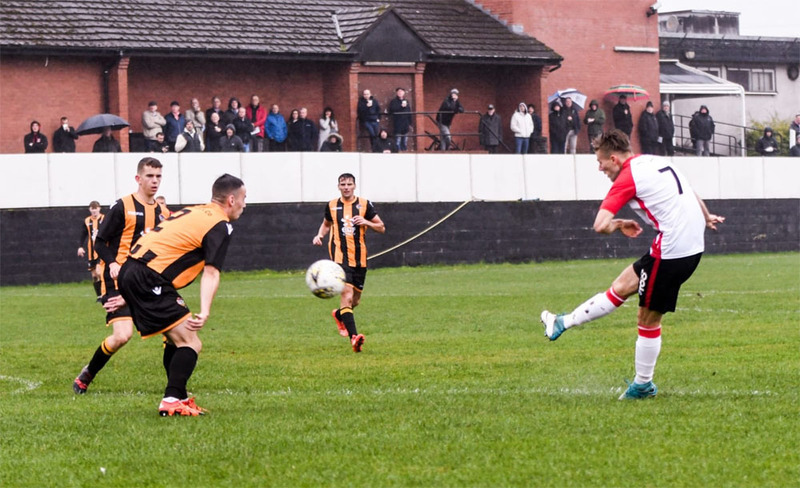 The Bankies front man sent in a low cross to the near post that Hepburn could only divert wide of the target. Then, Hepburn missed a much easier chance to score minutes from the interval when he raced beyond the Thistle defence. Cousar was off his line, and Hepburn tried to lift the ball over his head, but he didn’t hit the ball nearly hard enough and it ended up a routine save. The Bankies began the second period with intent to kill the game with Nicky Little crashing a shot just over the bar from the edge of box after good play by Liam Rowan. After that, Largs gradually began to dominate proceedings but found the Bankies defence in fine form. The frustration was beginning to tell as Jamieson and Little made it the second and third Largs players to enter the refs book in this period. The best Thistle could manage was a winding run by Millar that ended with his shot deflecting to Jamieson in the box, but his shot was well over the bar. With just over quarter of an hour tempers began to flare with several flashpoints. The visitors unable to break the Bankies down were engaging in some afters, with Faulds and Carter both being booked with Clydebank’s Fitzgerald joining them. 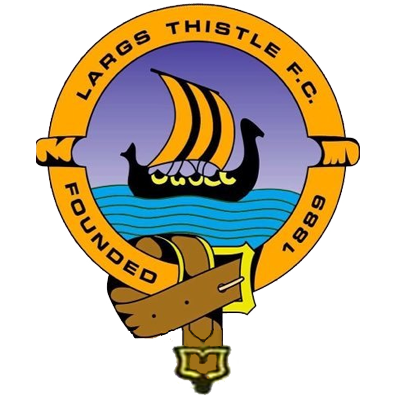 After this, Largs finally had their best chance of the match when a Thistle forward found himself free about twelve yards out on the left hand side. He picked his spot beyond Waters, but he didn’t count on Andy Paterson who made a superb block on the line to keep the Bankies goal intact. All of the visitors probing counted for nothing as two minutes later the Bankies wrapped up the three points. A short corner on the left hand side saw Cammy McClair deliver the ball to the near post where Nicky Little came to meet it with a lovely glancing header that found its way into the net at the bottom corner leaving Cousar stranded. Largs pretty much gave up the ghost after this, but Jamieson was sent up front to cause as much havoc as he possibly could, and he did. He spent the remaining minutes leaving his foot in after the ball had gone and making several ill-judged challenges. He caused the last major flare up, but walked away unscathed as the ref had his back turned. This incident led to Vezza being shown a yellow card with Adam making it six for the visitors. 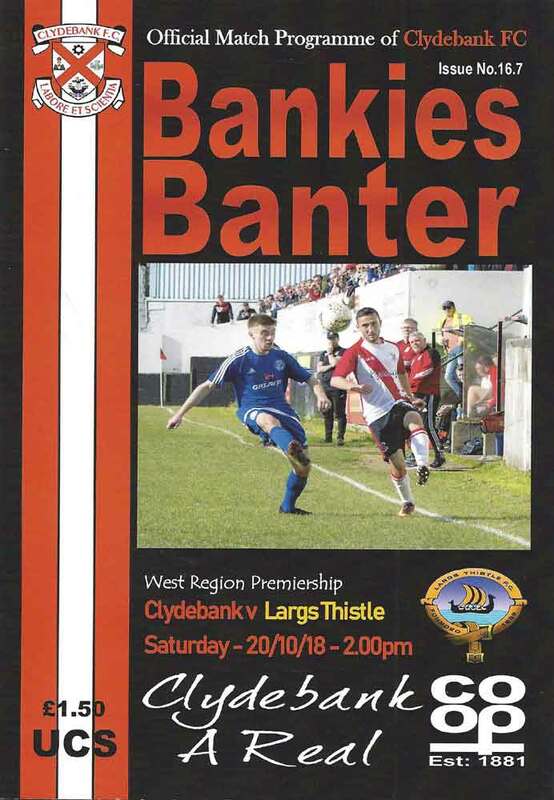 Largs are a very decent side, and there is no way they are going to give the match to you, so the Bankies had to be prepared to fight and battle. It has to be said that each and every player did just that. The defence were outstanding and deserved their clean sheet. The midfield fought for every ball, and despite being under pressure at times they still created several chances for the forwards. Up front the attacked always looked dangerous and could have scored more than the three they did get. Every player deserves pass marks, but special mentions for Andy Paterson who made vital blocks, Chris Black who put in a tireless shift, Del Hepburn whose pace was a real problem for the Largs defence (he just needs to find his shooting boots) and Nicky Little who will surely pass Mark Hailstones as the Bankies all time top goalscorer in the Juniors at some point this season.